The school year is beginning anew, and it’s an exciting time for children and parents alike. Kids get to see their school friends again, continuing to develop those treasured social bonds, and stuffing in some education here and there, while parents have the house back to themselves for a few months. However, back to school time is not a big party for every family member. Pets, especially new pets, who aren’t used to spending much time alone can find themselves distraught with the lack of daily attention and company that they’ve become accustomed to over the summer months. This can lead to all sorts of mischief, mayhem, and undesirable property damage. So considering the season, we’ve decided to revisit a timely subject and talk about dogs with separation anxiety. Separation anxiety is a serious condition for dogs that can cause a lot of suffering. As extremely social animals, pack life is vital to a dog’s mental and social wellbeing. Puppy separation anxiety can be especially severe, so it’s important to take cautionary measures to keep a young pup from suffering unnecessarily. If symptoms are ignored, you’ll be in for a great deal of expense and time spent cleaning up tantrum related messes. An anxious dog will try anything to get out of the house so they can find their owners. That means wrecking blinds, chewing walls, and other general mischief. To minimize a dog’s discomfort and prevent the expense involved in repairing chewed up baseboards, it can sometimes be necessary to take some precautionary measures. Here is a short list of preparations you can enact to keep your pet’s anxiety to a minimum. 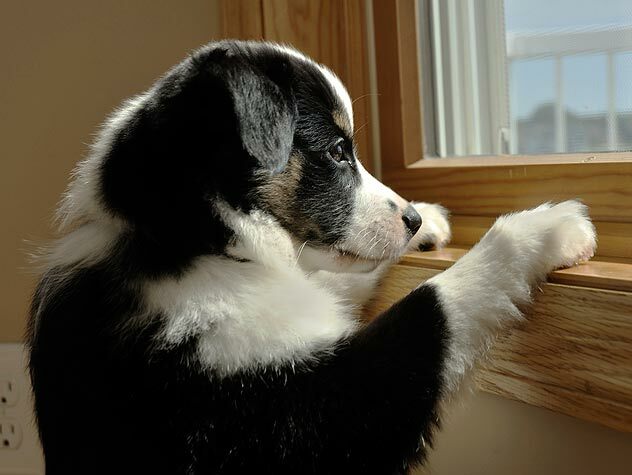 Dogs suffer from separation anxiety because they get lonely without human interaction. There are a few methods to alleviate the mental suffering caused by separation anxiety. Leaving a radio on is one way to help the dog feel at ease. The presence of background noise can break up the unpleasantness of complete silence. But more than creating the illusion of human presence, the best thing you can do for your dog is give it some structure. This is puppy training 101, but the simple act of giving commands and rewarding good behavior reinforces every other measure that you can take with your dog. A simple yet effective technique for getting your dog used to you leaving and returning is to conduct mock excursions. This means getting ready to leave, perform your whole routine, suit up, put on your shoes, grab your keys/wallet/what have you, and walk out the door. Wait a few moments, and then return. Each time your perform this exercise, extend the amount of time between leaving and returning. This will reassure the dog that you will always come back. You also need to master the ritual of leaving and returning. In general, it’s not a great idea to make a big deal out of it. Don’t dramatize things by stopping, stooping, and showering your dog with affection. Get your things and get out of dodge. The same goes for returning. Come in and handle your business before acknowledging your dog’s welcoming onslaught of slobbery kisses. If this feels too cold, you’re welcome to leave with a parting word. Though this is mostly for your benefit, the dog doesn’t really mind if you forget to say goodbye, just so long as you come back and provide food, water, and lots of affection. You should also leave something for your dog to do while you’re away. My personal favorite is packing a toy full of peanut butter and letting the pup go to town. Though this is far from the only option available to you. If you try these various things, and nothing seems to help, it’s probably time to seek veterinary advice. If your dog isn’t responding to these different methods, it must be suffering from severe separation anxiety, and it will need to be addressed by stronger methods, best determined by a conversation between you and your vet. That’s all for now. Have fun at all the back to school functions and fall fun that accompany this busy season!